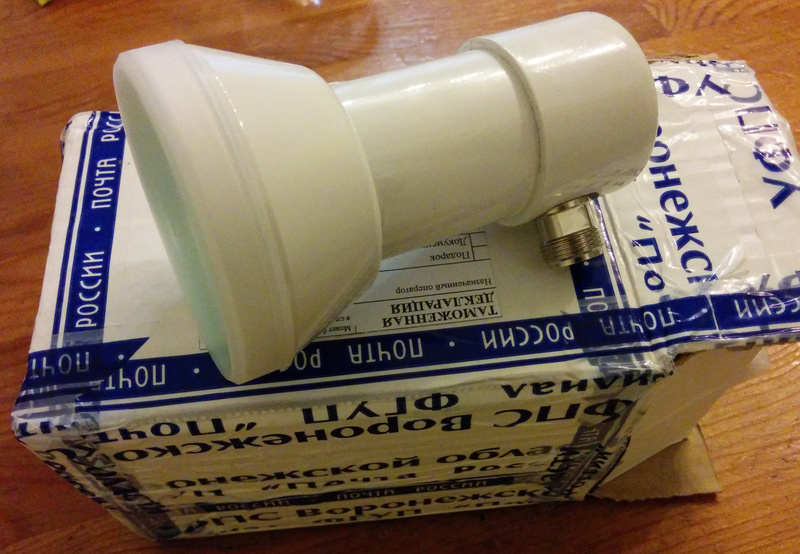 In this post [Link] i wrote about a 6cm horn for offset dishes from Russia. The horn was designed for 5720MHz and i was not able to tune it to 5760MHz were i wanted to use it. DG2DWL gave it another try and added a M6 tuning screw opposite to the feed tip. 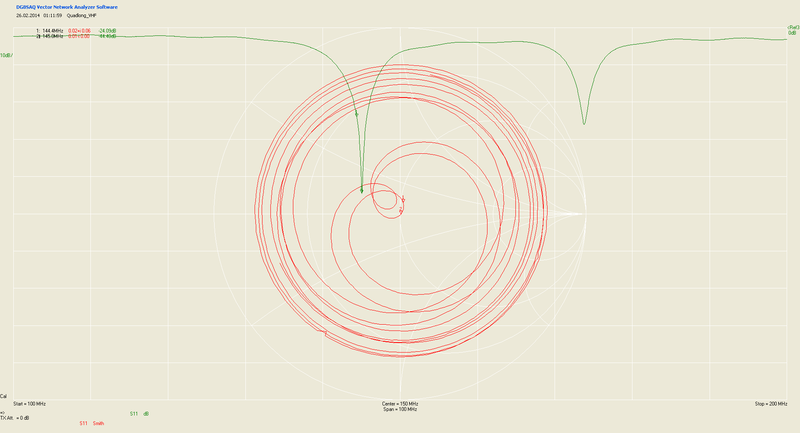 He managed to get the resonance to the correct frequency. So with some modification these horns are a good alternative for offset dishes in the 6cm narrow band section. 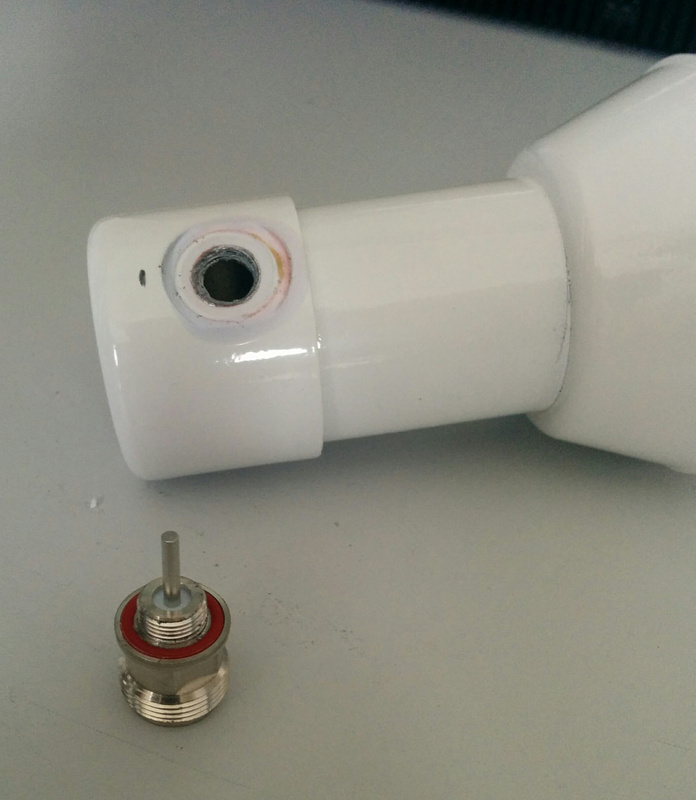 Not all things work out… I was searching for some nice feed for a offset dish to be used for 6cm narrow band. In the internet i found a nice version from Russia. 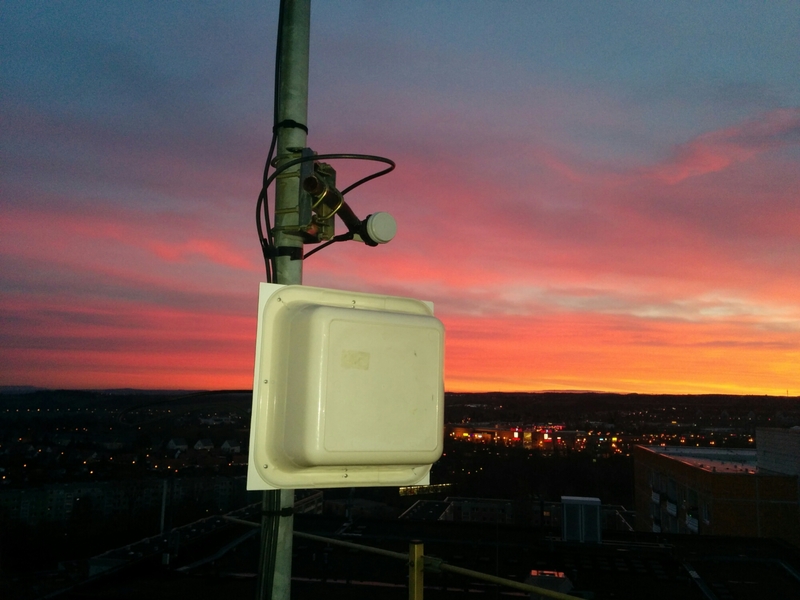 It was announced for the 5GHz WLAN band without dedicated specification of the exact frequency. For 40 Euro including shipment it was ordered and after only 2 weeks in transit (russian saying tells: For bad children Santa Claus sends the gifts by russian post… ;) ) and 1 week in customs i finally got my russian present. Measuring the input matching shows that its well in the middle of the lowest 5GHz WLAN band. Far away from 5760MHz. But ok, lets try. First i removed the N connector. The connector with the radiator seems to be a robust construction. I tried to shorten it step by step. Unfortunately it happened what could be expected. 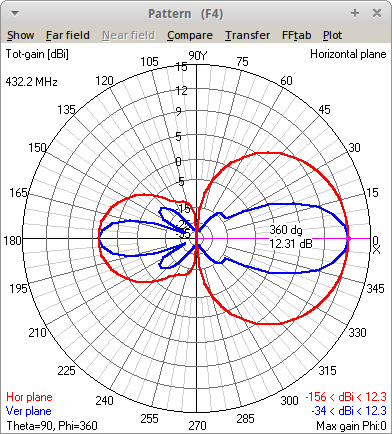 The feed can be de-tuned to about 5.5GHz but above that the matching vanishes. Probably the distance to the backside of the horn is too big. So this one was a fail. Fortunately i can still use it for WLAN if i make the radiator a bit longer again. 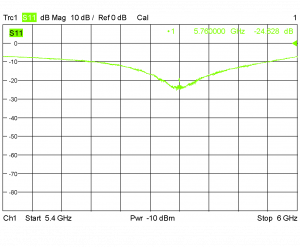 If you want to use the lowest of the 5GHz bands it is really a nice and very solid construction. A simple project in between. 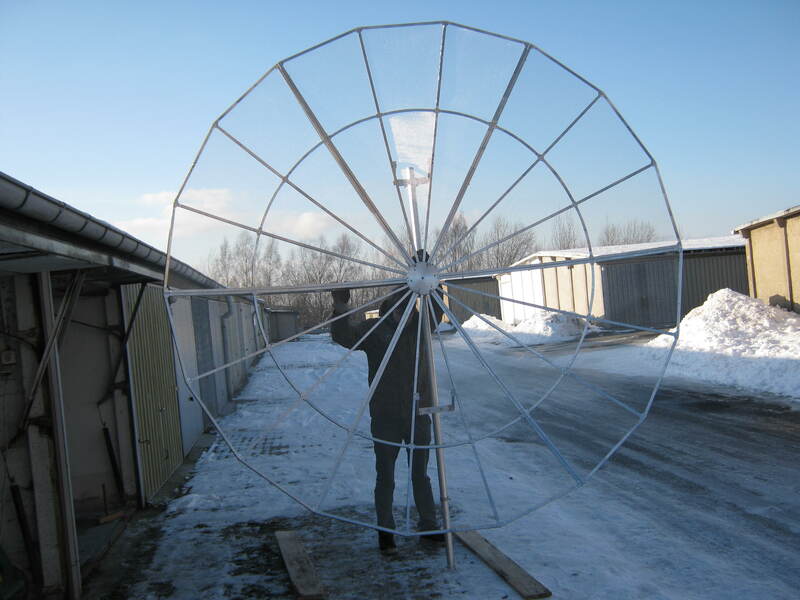 This is a small quadrifilar helix antenna for the L-band. The measurememt does not exactly fit the calculation but for the first trial it seems ok. Probably the thickness of the material was not considered for calculation of the length of the loops. The big antenna is the bi-quad for 23cm and above the LNB Horn antenna for 3cm. 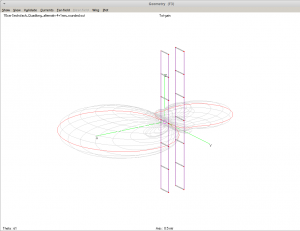 Since i needed a very lightweight antenna for 70cm for my fibre mast i looked at the Quadlong antennas published by DK7ZB. I downloaded 4NEC2 and started playing around. I simply entered the VHF version and scaled it to the available materials and 432.2MHz. 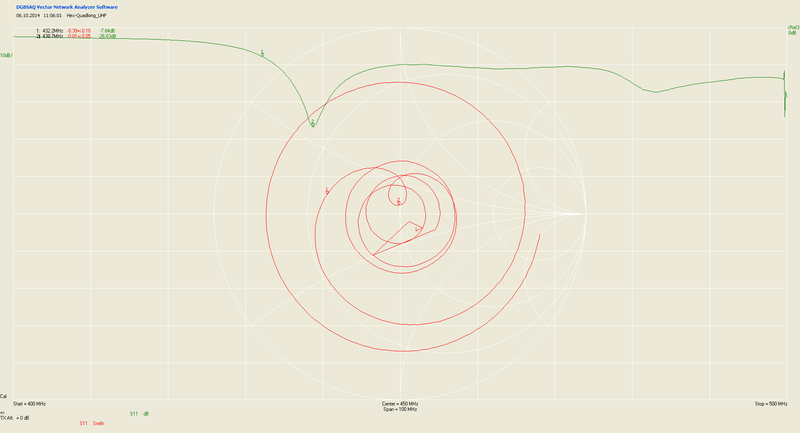 To be honest i dont have a lot of knowledge about this simulation tool but the result looked promising. 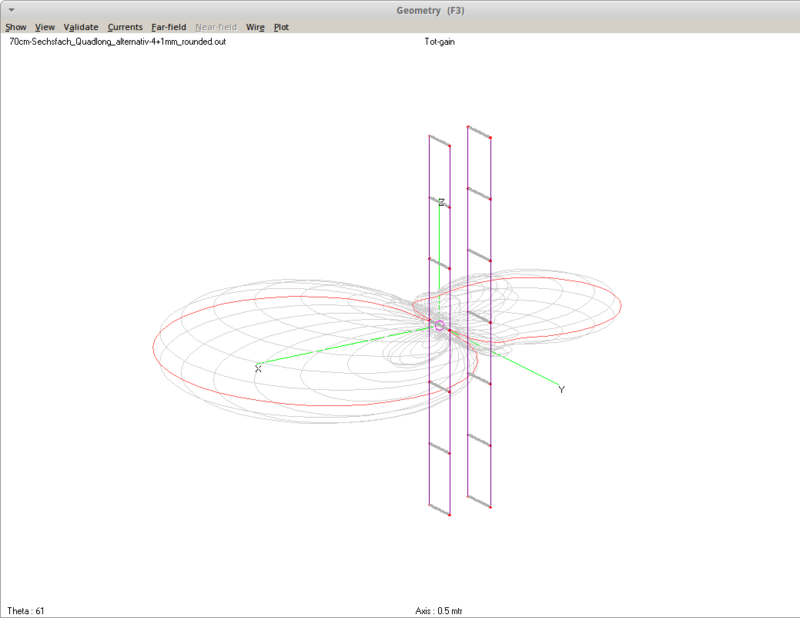 So i added extra segments at the upper and lower end of the antenna and rescaled it to get proper matching again. The result was promising again. 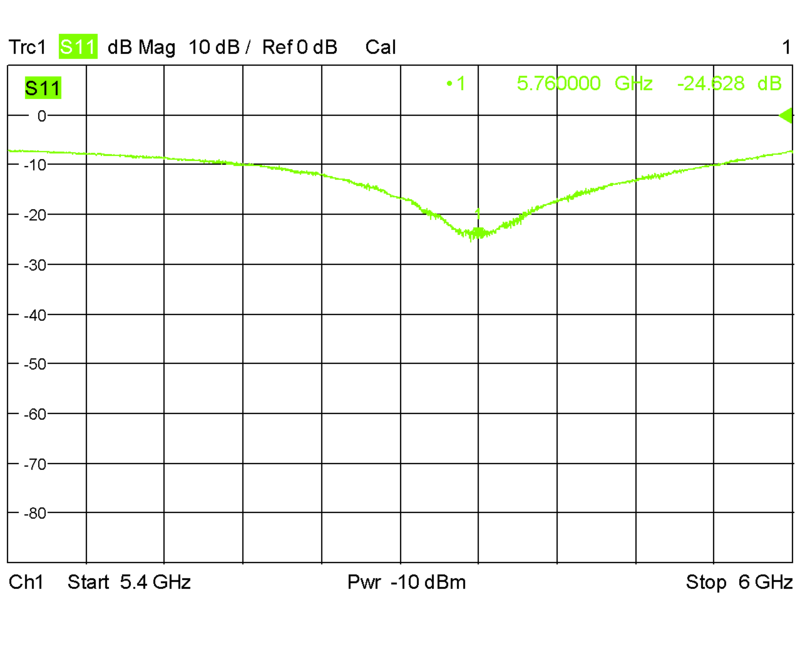 >1dB more gain then before. 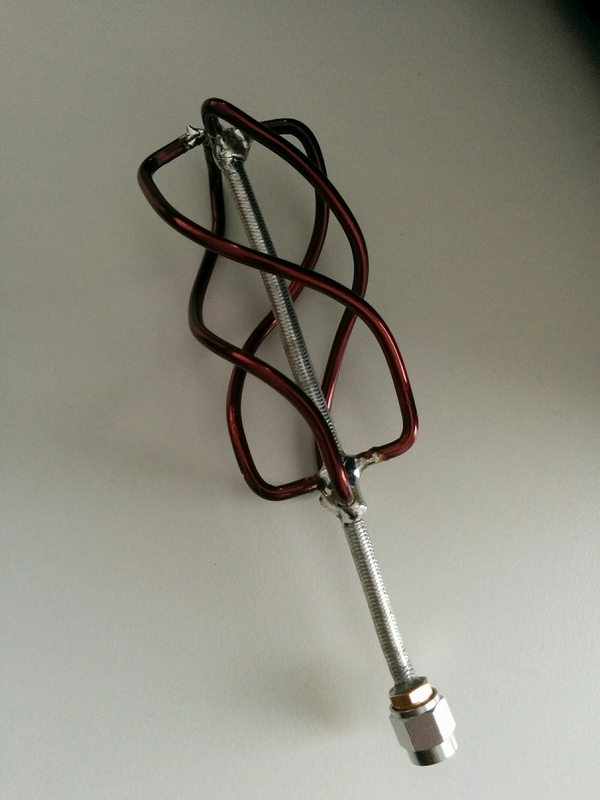 I made the antenna from 4mm brass material for the horizontal elements and 1mm copper antenna wire for the vertical elements. 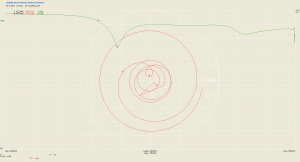 Some drawings of the VHF version you can find at the webpages of DK7ZB. BTW i dont trust the gain calculations of 4NEC2 at this stage. I did not simulate with another tool. Let me know if you do so. I can provide the NEC file i created. Just drop me a line and i send it to you. 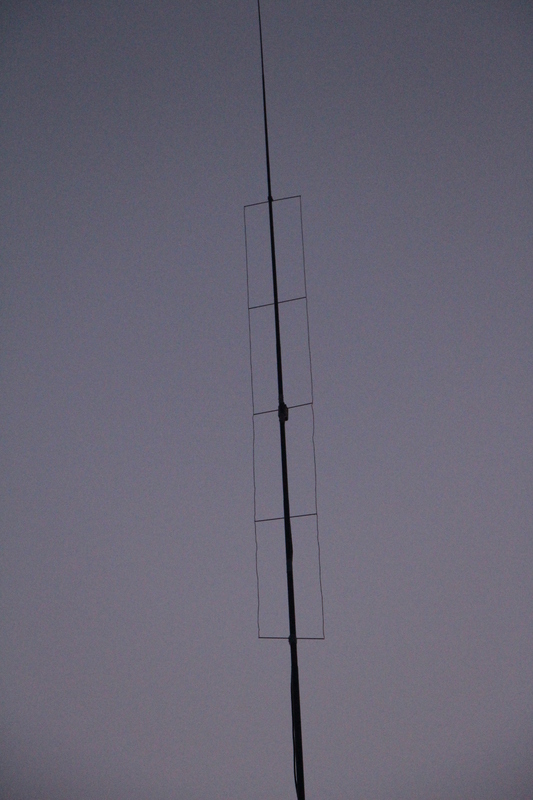 Since i finshed when the UHF contest was already started Saturday i decided to glue the antenna to the mast by means of tape. 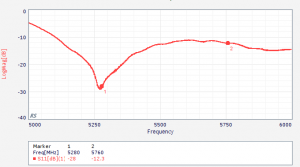 VSWR showed not too good result on 432.2MHz. 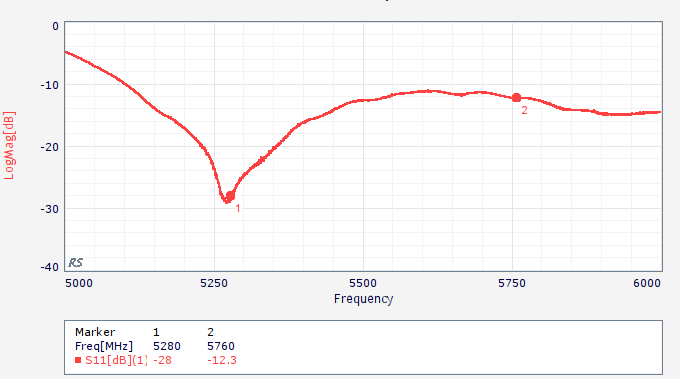 Tuning few MHz forth and back gave the impression that the resonance was too high. Maybe i will do a slight rescaling of the vertical elements to shift it a bit down. Also the mounting needs to be improved. 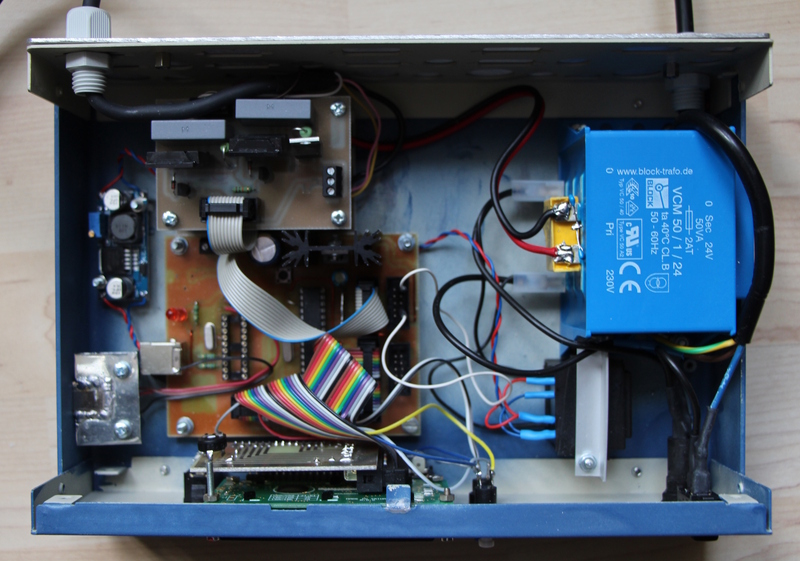 My rotator control unit (design by DL1DBR) is more or less finished now. The following picture shows the inner of the rotator control unit. Starting with the right upper edge: Thats the 24V AC transformer that supplies the motor of the rotor unit. Below that there is a small black part. Thats the 15V transformer that generates the voltage for the digital part. Using the 24V from the motor supply resulted in crazy measurements due to the strong interference from the motor. 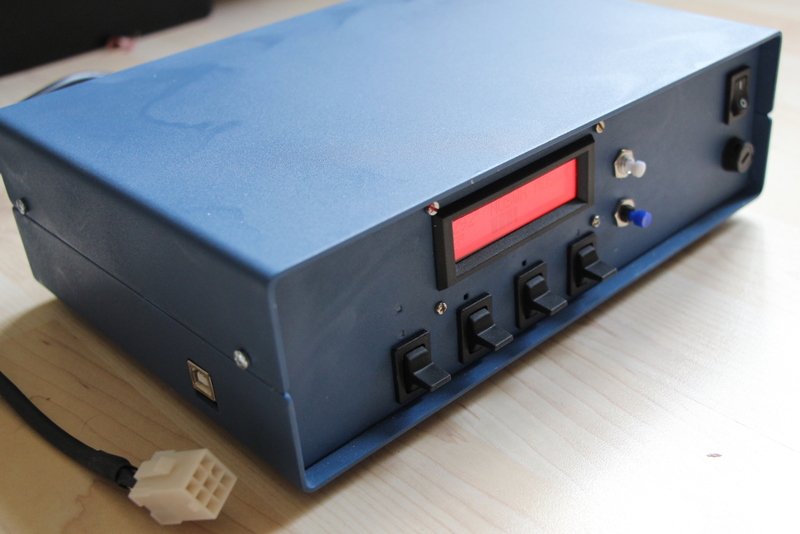 At the lower edge you can see the display PCB mounted to the frontside of the enclosure together with the keys. Above there the brown PCB is the main control unit that is driven by a Atmega controller. 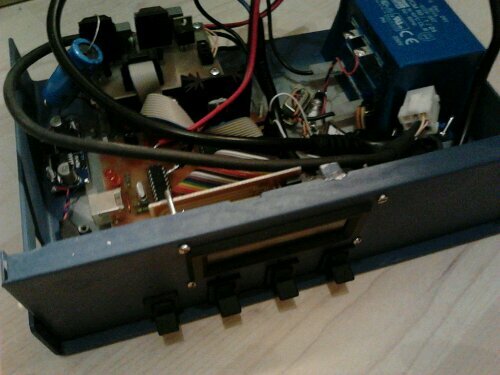 It gets its supply from the blue PCB on the left edge of the enclosure which is a DC/DC converter that generates about 8.5V out of the voltage from the black transformer. The PCB above the controller PCB is the driver for the motor. Actually its two identical PCBs stacked. The capacitor for the phaseshift of the motor resides in between this stack. The PCBs use each two solid state relais for switching the supply voltage. For the remote control of the unit i replaced the Attiny CDC implementation by a FTDI USB-UART adapter that is mounted at the left side. Its the silver part there. In case you have questions… Let me know. Since quite some while i try to get the DL1DBR rotator control unit completed. I changed the controller firmware a bit, adopted the driver connection for my KR-600 and started to build the stuff into an enclosure. Now only a few wires have to be connected and some holes need to be drilled. The control unit can drive up to two rotators and its possible to control it via a USB connection out of the most logging software. It also has some preset tables for directions that are often used. 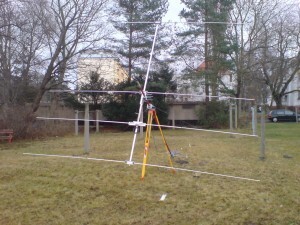 Martin, DK7ZB describes a horizontal, almost omnidirectional, 2m VHF antenna. Its leightweight enough to mount it to a fiber mast. Its rather easy to build and fast to mount. I used 4mm brass tube for the horizontal elements and 1mm antenna wire for the vertical elements. 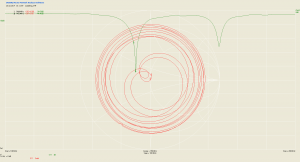 Therefore the resonance isa bit too high but this should not be a too big problem. The pictures show the antenna on my 10m fibre mast mounted at the balcony and the S11 measurement data (calibrated to the input of a 15m Aircel7 cable). Gert, DG0CN has send me a picture of the new 3m mesh dish design for EME usage he recently made. EDIT 2017/06/28: i got the information that Gert passed away weeks ago. His business will most probably not be continued. The webpage already has gone. RIP. 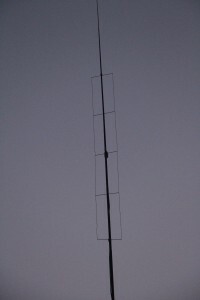 Today i mounted the 4el Yagi to the mast. I put the system to the garden in order to try how difficult it is to set it up alone and to do some measurements. 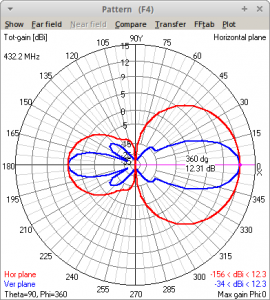 Center frequency seems to be around 28.500 or so. I heard some US stations and was able to work K8CW in SSB with 5W only. Nice start. 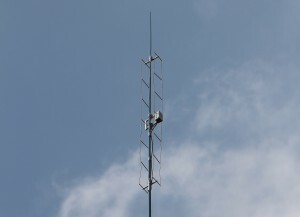 Hopefully also successful tomorrow… Hope to hear you in the 10m DARC contest.